The Self Propelled Bulk Loader is known for field efficiency and design engineering. 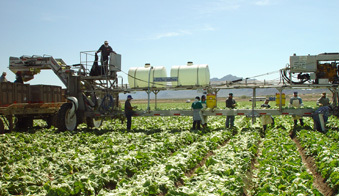 In most cases, the Ramsay Highlander machines have been known to highly reduce the cull rate on products such as tomatoes, lettuce, bell peppers, and cantaloupes. Most importantly the Ramsay machines are proven to reduce harvesting costs through labor savings while increasing the efficiency of your harvesting crews output. In gaining that control, a crew can produce more in an 8 hour day and in return can plan plantings and form management practices around the use of this machine. Built in mild steel, manufactured in all stainless steel to meet food safety requirements and to meet program specifications such as GAP (Good Ag Practices) and HASP (Hazardous Ag Safety Practices). Our machines meet or exceed third party auditing from companies such as Primus Labs. The steering and turning design increases the field efficiancy and increases output per person and productivity.